Last week, I saw a link that Michael Ruhlman shared on Facebook. It was for bacon jam that he saw on Twitter and he couldn’t stop thinking about it. Then, I couldn’t stop thinking about it. I decided to take one of my off days this week to make this concoction. So, Monday, I sliced onions and chopped bacon. I rendered said bacon. Saved some drippings. Cooked the onions. Threw everything in one pot and waited. And as I waited, this heavenly aroma of bacon, onions, vinegar, and syrup wafted around the apartment. I didn’t keep checking on it because I wanted to make sure it wouldn’t burn. I kept checking on it because I couldn’t wait for it to finish. I wanted to taste it. When the moment finally arrived several hours later, I think I found the human equivalent to Anna’s Bliss. It will cure what ails you. If just for that moment you hold it on your tongue savoring it. I could have eaten it with just a spoon right out of the pot. I wouldn’t recommend it though. It could lead to one heck of a bellyache. 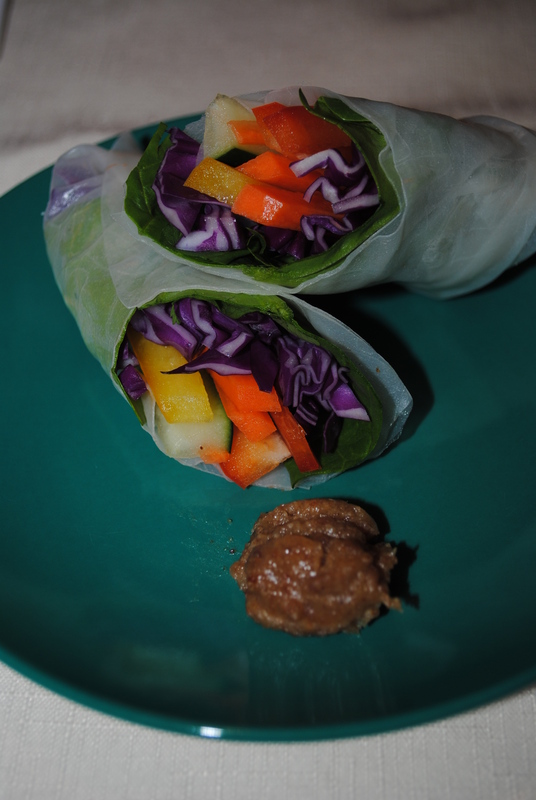 I decided during my tasting that I didn’t even need to make a dipping sauce to go with the Raw Veggie Spring Rolls (post to come later) I was making for dinner. Sure it messed up my Meatless Monday, but it was worth it. My husband loved it in silence. I think that is where we are both alike when it comes to food. When something is really good, we talk about how good it is. We make those “mmmm” noises. When something is spectacular, we’re too busy savoring it and eating it to make any noise or comments at all. If you watch Top Chef, it’s like on Wednesday’s episode when Padma asked Tom how he liked Carla’s Chicken Pot Pie and he says, “Too busy eating” before leaning over to take another bite. Yeah, it’s like that. In fact, after a few bites he asked, “What kind of sauce is this?” I answered, “It’s not sauce. 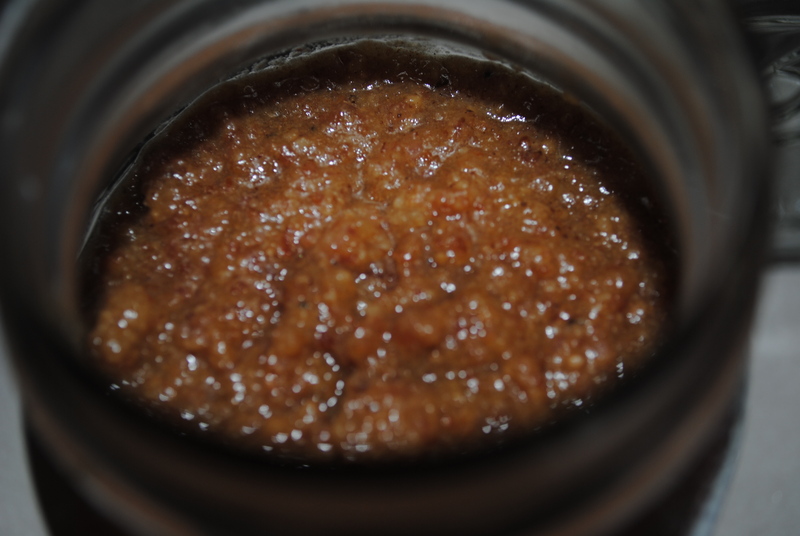 It’s bacon jam!” with a huge grin on my face. Yes, I was rather pleased with myself even if it was someone else’s recipe. I eagerly awaited the following morning for breakfast. Yes, the picture from the post really got to me. What’s not to love about runny eggs with bacon? And yes, those of you who don’t like runny eggs, I get it. 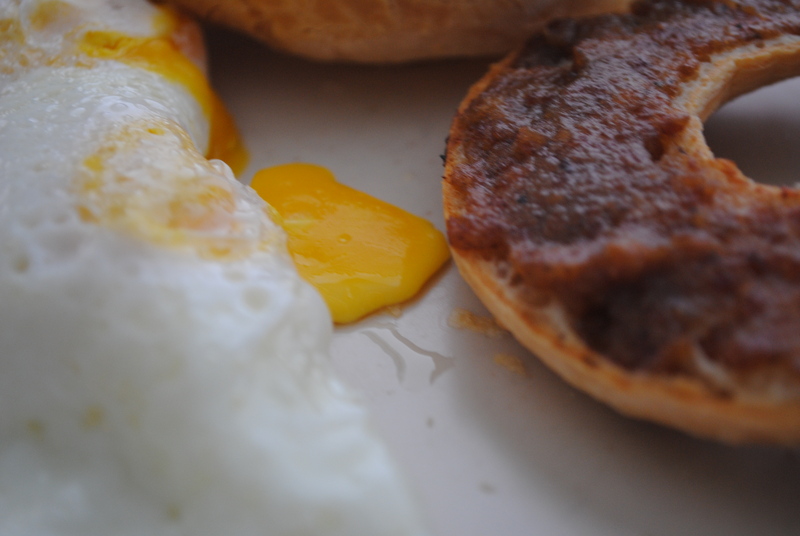 There was a time I didn’t like runny eggs, let alone egg yolks. Now I can’t even imagine life without them. Eagerly isn’t quite it. I was ready to actually fix breakfast after I fixed dinner just to have runny eggs with bacon jam. Alas, I didn’t. I was good and I waited until the next morning. It was well worth the wait and an excellent way to wake up the taste buds for the day. I did make half the recipe so I don’t have a lot of bacon jam sitting around in the fridge. I consider that a good thing since I was tempted to eat it straight out of the pot. I also didn’t use brown sugar. I just used more pure maple syrup. I thought I had cider vinegar, but I didn’t. I used distilled vinegar instead. I thought it might be too strong, but it wasn’t. At least not for this vinegar lover. One thing I must pass on to you is, beware of the bacon jam curse. Once you make it, the entire house/apartment smells of it and makes you want to eat. This entry was tagged Against The Grain, bacon, Bacon Jam, Eggs, gluten-free bagel, Michael Ruhlman, pure maple syrup, Raw Veggie Spring Rolls, Vinegar. Bookmark the permalink. Oh this I have to try!! It is a MUST, V! I have to admit that I don’t like traditional fruit jam … I know that’s weird. But if bacon, onion, and vinegar are involved … now that sounds good. And, since Michael shared it–and he has become the bacon king in my mind ever since I watched him back it at BlogHer Food last year–I think it’s a must make after this week of Valentine’s Day craziness at my house (i.e., hosting big party next weekend). BTW, I first read your one statement as you taking a day off to make this recipe. LOL But, I would so get that if you had!